There are many ways to subscribe to JazzSkills for Piano. You can receive your choice of one of the JAZZ MASTERCLASS: Step-by-Step lessons. The JAZZ MASTERCLASS: Step-by-Step lessons are individual jazz lessons by Martan Mann. This is a great opportunity to experience the step-by-step lesson structure of the extensive online jazz course, JazzSkills for Piano. “Preparing to Play in All Keys"
Receive Your Lesson NowOnly $4.95 for one of the JAZZ MASTERCLASS lessons. To purchase your $4.95 lesson, just click the circle above the lesson you want. Welcome to JazzSkills for Piano. No fooling . . . this is the most effective method to become a jazz pianist. This is NOT a simplified quick & easy approach. 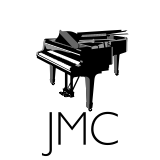 It is a deep consistent carefully planned method of learning jazz piano to develop the actual skills which will enable you to comfortably and creatively improvise jazz. These lessons literally take you from . . . here to there. We start at the beginning with classical improvisation and move toward advanced jazz study. In this method you are given specific lessons activities and information to place in your subconscious. Each small step is learned completely. It is the subconscious which does the work. Eventually it’s the subconscious which does all the playing! You develop your jazz piano skills step by step at your own pace. You have the joy of playing jazz! This method works. You will learn how to play jazz piano with my online lessons. Let’s get started! Examine the skills that you presently have . . . and then surmise what skills you want to achieve. That will let you know which lessons need to be mastered first-second-third-etc. If you are a beginning pianist who wants to start the improv process by learning theory, the theory and motion exercises are here to get you started. If you are an accomplished classical pianist who wants to develop general improvisation skills, there are specific lessons just for you. If you are a teen who is being introduced to jazz band, look for the specific lessons which will teach you how to comp . . . and how to solo. Are you a jazz player who wants to deepen your skills, there are advanced lessons for you. Are you a vocalist who wants to back yourself, there are great lessons in developing comping skills. Each lesson develops one skill to be mastered by the subconscious. You study what you need. You can access The Private Lesson (blog) for new supplements and blog posts by Martan. Studying JazzSkills for Piano is like taking private lessons from Martan. Study at your own pace. Make the needed changes in your subconscious to be a fine jazz player. Start improving your jazz studies today! View lessons for a six-month period with 20% discount. View lessons for a one-year period with 50% discount.